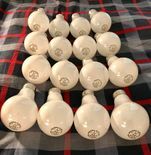 These bulbs were part of an eBay lot of other NOS 15 and 25 watt incandescents. 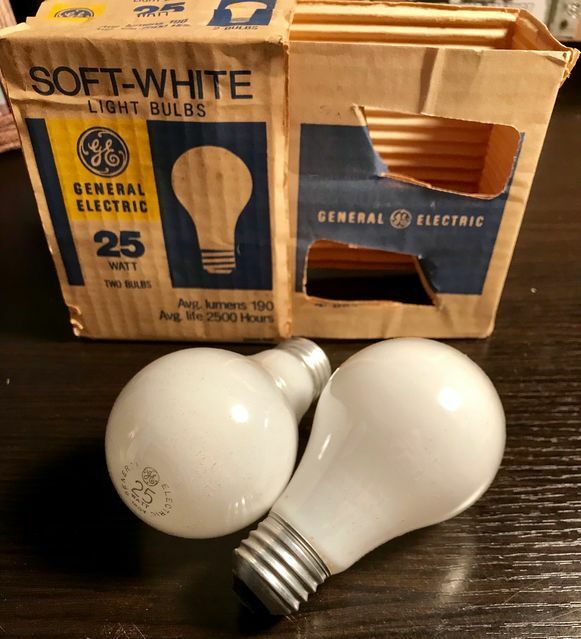 These 25 watt GE bulbs are similar to the Sylvania 25 watt bulbs due to the short neck A19 shape, the C-shaped filaments, and the "window box." I've never seen a GE package with windows. The rugged filament produces slightly less light (190 vs. 210 lumens) though it looks much more durable than the bendy C-6 horizontal filaments seen in more modern GE 25 watt bulbs. I'm guessing these are 1970's or 1980's vintage. Nice find! These are '70s vintage. Cool! My oldest incandescent lamp is a Ken-Rad from '43-'45 and the next oldest is a GE spotlight from April '56. A little newer 1982-84 vintage. The GE 25w bulbs had the Q coat until 1982 or so.